The Itsy Bitsy Spider Crochet: The Batties Are Here! This pattern has been hiding in my pattern book for about a year now, begging to be published in time for this Halloween... and here it is, my friends... my Little Amigurumi Bat! 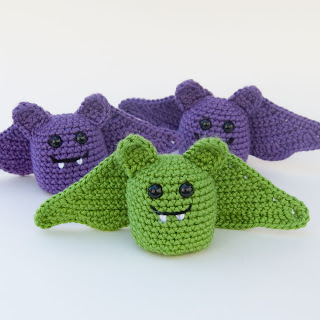 My little bats are the perfect companions for the ever-popular spooky little ghosties (pattern here) and look ever-so-adorable perched on one of those perfect little pumpkins we made in last fall's crochet-along. So, are you ready for the hook-up?